Lenovo is kicking off 2017 with the introduction of a number of consumer and business products ahead of the Consumer Electronics Show. Leading the lineup this year is a smart home speaker powered by Amazon’s Alexa. Also part of Lenovo’s CES lineup is the refresh of the ThinkPad X1 series, along with new Legion Y series gaming notebooks. 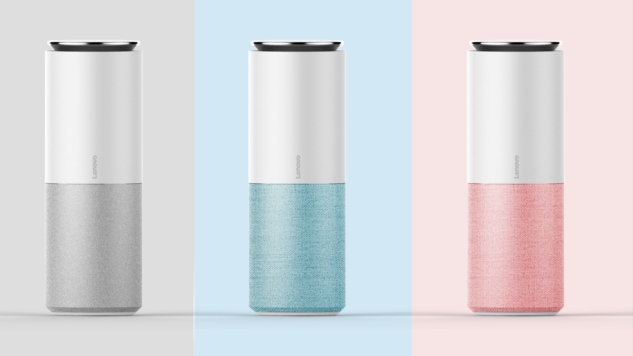 Lenovo’s new Smart Assistant is a WiFi and Bluetooth-enabled smart home speaker that responds to voice commands. The Lenovo-built speakers come with the intelligence of Amazon’s Alexa built-in, so it’ll be interesting to see how the Smart Assistant stacks up against Amazon’s branded Echo line. For its part, Lenovo said it was “built in collaboration with Amazon” and boasts an elegant design. Smart Assistant also integrates with Lenovo’s smart home devices and third-party products. The speaker utilizes a cylindrical design and is powered by Intel’s Celeron N3060 processor. It comes with a single 5W tweeter and a 10W woofer built-in, and has 2GB RAM and 8GB of storage for music streaming. Because of the cylindrical arrangement, it comes with six dual-array microphones to enhance voice recognition, and the speakers will be available in Light Gray, Harman Black and Orange color hues to fit your home. Lenovo Smart Assistant starts at $129 and will be available in May. In addition to the Smart Assistant, Lenovo will also introduce a networked Smart Storage drive for wireless file sharing that starts at $139. The drives come with up to 6TB of capacity. Lenovo’s ThinkPad X1 lineup also gets a refresh for CES. The line consists of three product categories: the ThinkPad X1 Tablet, which competes against Microsoft’s Surface Pro series, the ThinkPad X1 Yoga, a convertible notebook with a 360-degree rotating hinge and the ThinkPad X1 Carbon, a slim Ultrabook that utilizes a more traditional clamshell form factor. All three items originally debuted at last year’s CES, but Lenovo is giving X1 a boost this year with the inclusion of Intel’s 7th Generation processor, also known as Kaby Lake, bringing increased power efficiency and modest processing improvements to business users. The ThinkPad X1 Tablet was one of my favorite hybrids from last year, boasting a design similar to what Lenovo offered on its Yoga 3 Pro. It comes with up to a 1TB SSD drive, 16GB RAM, USB C and USB 3.0 ports, plus options for 4G LTE connectivity along with WiGig docks. The Tablet comes with modular expansion options, including an extended battery, a projector dock and a 3D scanner module. Like the Surface Pro, it also has a detachable keyboard. Weighing in at 1.69 pounds for the tablet and 2.35 pounds with the keyboard, Lenovo says the 12-inch slate with a 2K resolution display will retail starting at $949 when it goes on sale in March. Lenovo claims up to 15 hours of battery life with the extended battery on the X1 Tablet. If you’d rather not deal with the detachable keyboard, the ThinkPad X1 Yoga is a 14-inch convertible notebook with a swiveling 360-degree hinge that allows the laptop to transform into a tablet similar to HP’s Spectre x360 and Lenovo’s Yoga 910. The ThinkPad Yoga will come with Kaby Lake, up to 1TB SSD storage, 16GB RAM, Intel Iris Plus Graphics 640 or Intel HD Graphics 620 integrated graphics options and up to 16 hours of battery life. Lenovo also makes a version of the QHD-resolution screen with an OLED panel as an upgrade. The X1 Yoga weighs in at 3.13 pounds and starts at $1,499 when it goes on sale in February. The ThinkPad Yoga also supports Lenovo’s active digitizing pen, comes with two Thunderbolt 3 ports, three USB 3.0 ports, HDMI output and an Ethernet jack. If you prefer a more traditional notebook form factor, the ThinkPad X1 Carbon is a slim business Ultrabook with a 14-inch WQHD display. It boasts similar features to the Yoga-branded model, but drops support for the active digitizing pen and comes with one fewer USB 3.0 port to keep things slim and light. With up to 15.5 hours of battery life, the Carbon edition weighs in at a more svelte 2.49 pounds. The Carbon edition starts at $1,349 and goes on sale next month. Lenovo is unveiling its new Legion-branded Y series gaming laptops at CES, and the notebooks offer a number of innovative technologies to target gamers. These powerful systems come with support for Intel’s 7th Generation Core i7 Kaby Lake processors, Nvidia GeForce graphics, hybrid storage and Dolby Atmos audio support for immersive sound. Additionally, the laptops are VR-ready and gamers can opt to use the multi-colored LED backlit keyboard or a wireless Xbox One controller to play. The Legion Y720 laptop comes with support for Nvidia’s GeForce GTX 1060 discrete graphics with 6GB of GDDR5 GPU RAM and 16GB of DDR4 system memory. The notebooks come with a single Thunderbolt 3 port alongside three USB 3.0 ports, an Ethernet port, audio jack, headphone jack and DisplayPort. The Y720 comes in either a 15.6-inch FHD or UHD 4K resolution display and weighs in at 7.05 pounds. All this gaming power will set you back $1,399 when the Legion Y720 becomes available in April. If you can’t wait, a Legion Y520 with more modest hardware will be available starting in February at a base price of $899. The Y520 isn’t marketed as VR-ready and comes with a GeForce GTX 1050Ti graphics and tops out with a FHD resolution display. It is lighter at 5.3 pounds, and the system comes with custom audio tuning instead of the Dolby Atmos support of the more premium Legion Y720. If the ThinkPad X1 Tablet looks a little too business-focused with its all-black design and modular expansion, the Miix 720 comes with a more consumer-centric design with its Iron Gray and Champagne tones. The Miix 720, also available with Intel’s 7th Generation processor refresh, will start at $999 with a backlit keyboard included when it goes on sale in April. Rather than the bottom-placed kickstand of on the ThinkPad X1 Tablet, the Miix 720 comes with a more Surface-like kickstand. The kickstand is adjustable to a number of angles and comes with the same innovative watchband hinge design, similar to the one on the Yoga 910. Lenovo claims that the Miix 720 comes with up to eight hours of battery life, and the unit comes with a front-facing IR camera that supports Windows Hello logins, giving it a similar security feature as the Surface Pro 4. The Miix 720 can be configured with up to 16GB DDR4 RAM, 1TB PCIe SSD storage and up to a Core i7 processor. It has a bright 400-nit rated 12-inch 2880 × 1920 resolution display. The Miix comes with a single USB Type-C port, USB 3.0 port, USB 2.0 port and audio combo jack. Thunderbolt 3 isn’t supported on the portable system, which weighs in at 1.72 pounds without the keyboard and 2.42 pounds for the package. Like the ThinkPad X1 Yoga and Tablet models, the Miix 720 also supports Lenovo’s Active Pen 2 stylus.